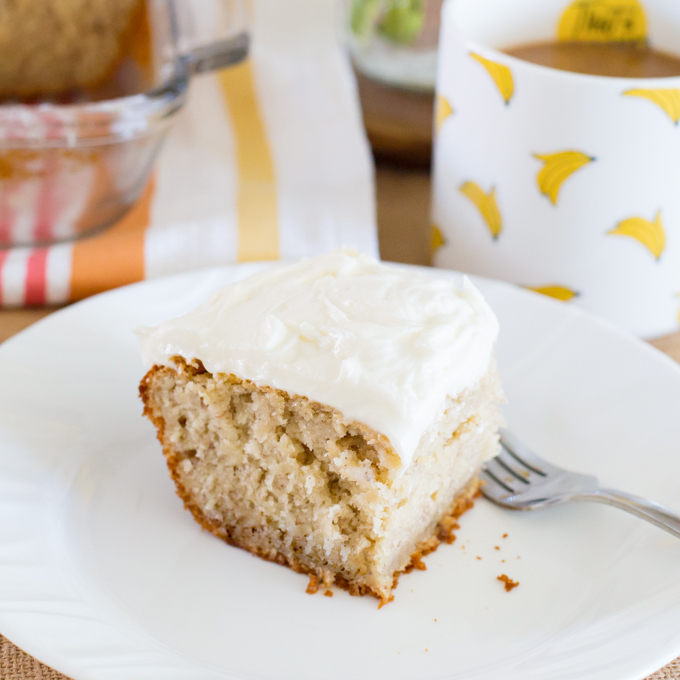 Don’t toss those brown bananas, instead make this delicious Homemade Banana Cake with Cream Cheese Frosting!! 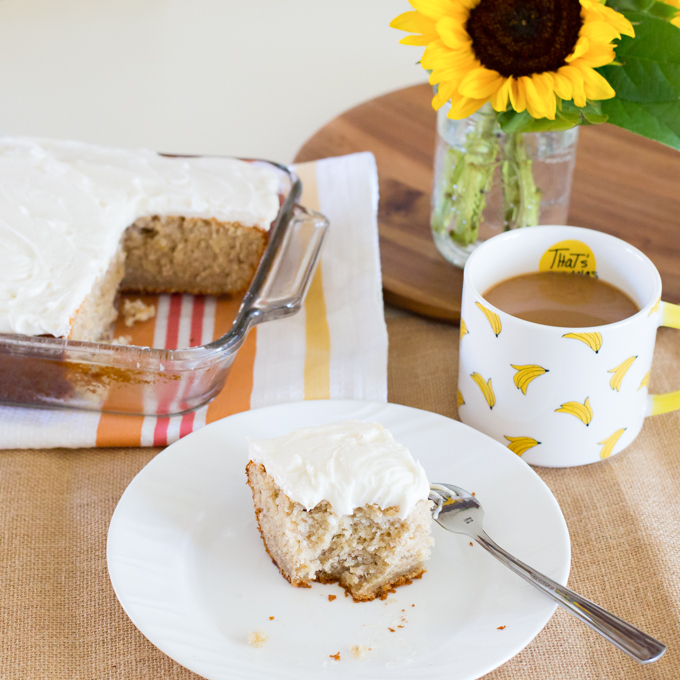 This is seriously the best Banana Cake I’ve ever had and even your non-banana fans will love this cake! I made this for a family dinner and everyone (kids and adults) loved it, even my daughter who isn’t a huge fan of cake enjoyed a piece and admittedly had another for breakfast the next morning and another later that evening! Did you know that if you don’t have any buttermilk that you can actually make your own with two simple ingredients? Simply add 1 tablespoon fresh lemon juice (or white vinegar) to 1 1/2 cups regular room temperature whole milk. Let is sit for a few minutes, then stir. I’ve never tried this, but this soured milk can be used in place of buttermilk in a recipe. Personally I think I’ll stick to store bought, but it’s a nice option in case you can’t make it to the market. 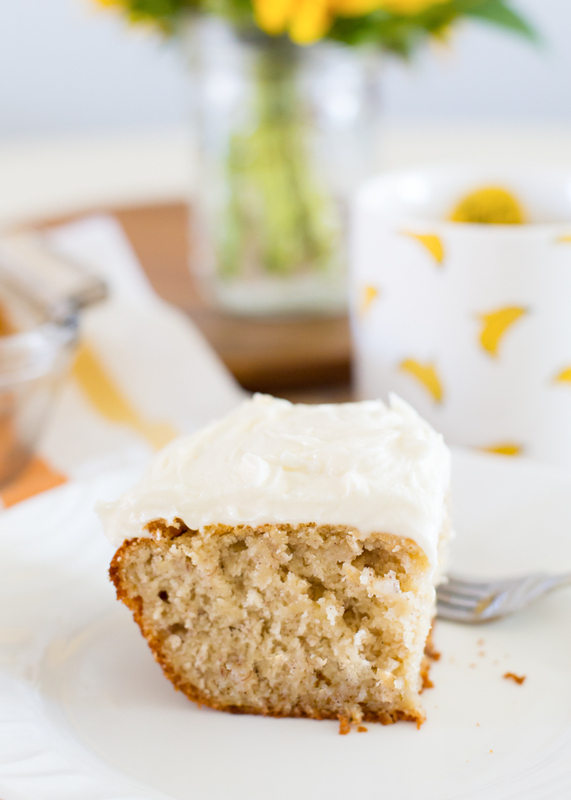 Don’t fret that I didn’t include any process shots, the batter came together in a matter of minutes and I trust that you can make this delicious Banana Cake with Cream Cheese Frosting without me showing you smashed bananas in a bowl or a picture of my cute aqua Kitchen Aide Mixer. 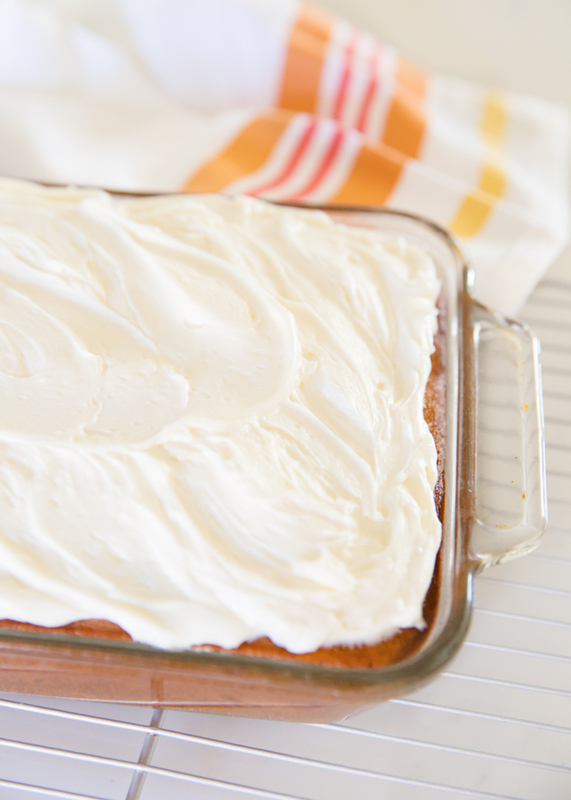 After mixing the batter, pour into a prepared baked baking dish. I used a little Pam Baking Spray with a light dusting of flour. If you prefer, you can use a light greasing of shortening and dust with flour. The recipe called for an 9×13 pan, but I was staying down at my little condo (which isn’t quite as equipped as my home kitchen) so I used what I had, an 8×11 and it worked out perfect. 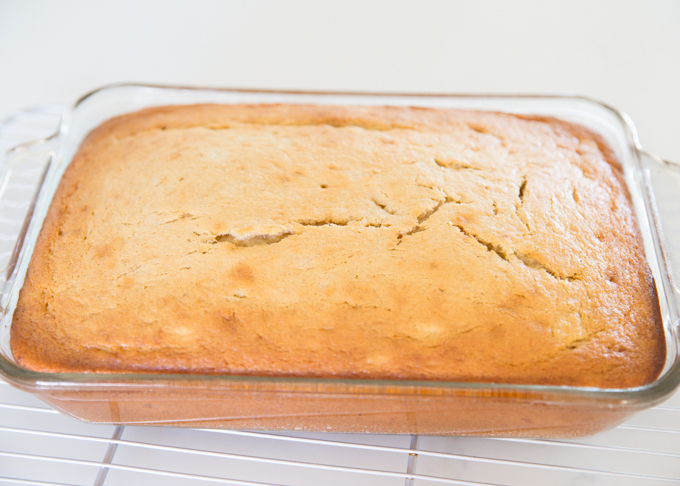 I just had to bake it for a few minutes longer since it was a thicker cake. 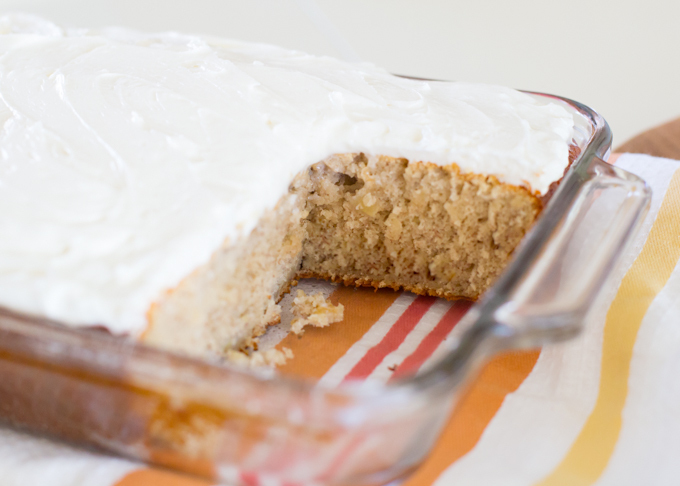 You could probably enjoy this cake without the classic Cream Cheese Frosting, but why would you want to? Ahhh, much better! Now, even though I was going to be serving this at a family dinner, I knew I wanted to blog this recipe, so I cut a piece out, photographed it and ate it! My family didn’t mind one bit! 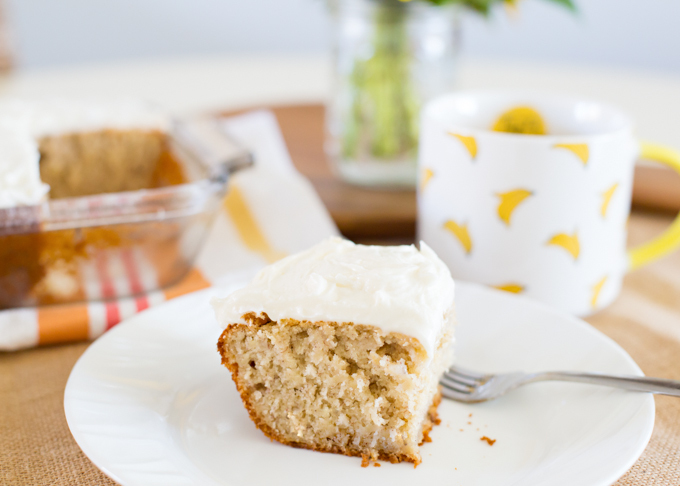 Definitely make yourself a fresh cup of hot coffee, grab a book, and enjoy a few bites (or a piece or two) of Banana Cake with Cream Cheese Frosting! 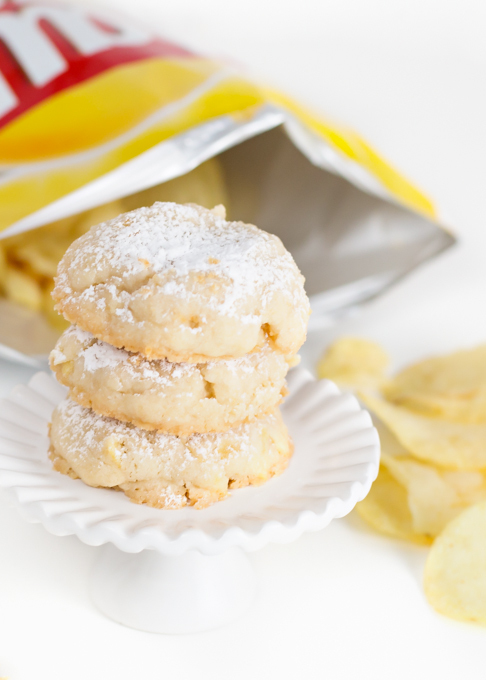 I’d love if you’d pin and share this delicious recipe! 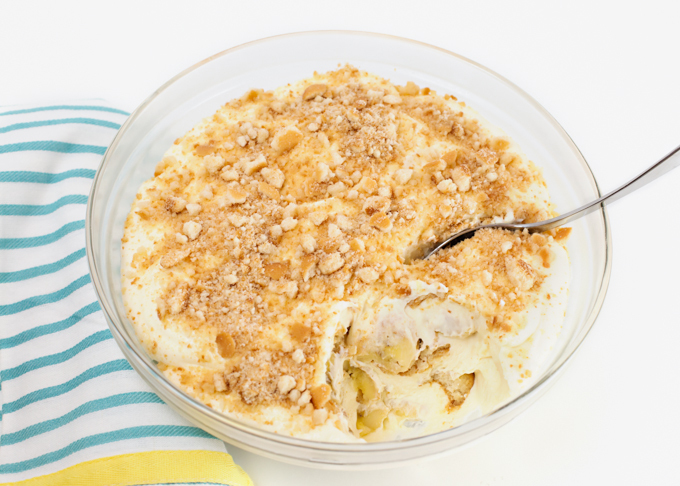 Peel bananas and break into chunks. Place in bowl or large glass measuring cup and mash with a fork. Set aside. Whisk together flour, baking powder, soda, cinnamon, and salt. Add granulated and brown sugar and cream together on high speed until smooth. Scrap sides of bowl as needed. Add vanilla and eggs and mix on medium until combined. Add mashed bananas until combined. Slowly add in flour mixture and buttermilk (alternating flour then milk) until thoroughly mixed together. Do not over mix. Bake for 45-55 minutes or until toothpick instead into center of pan comes out clean. 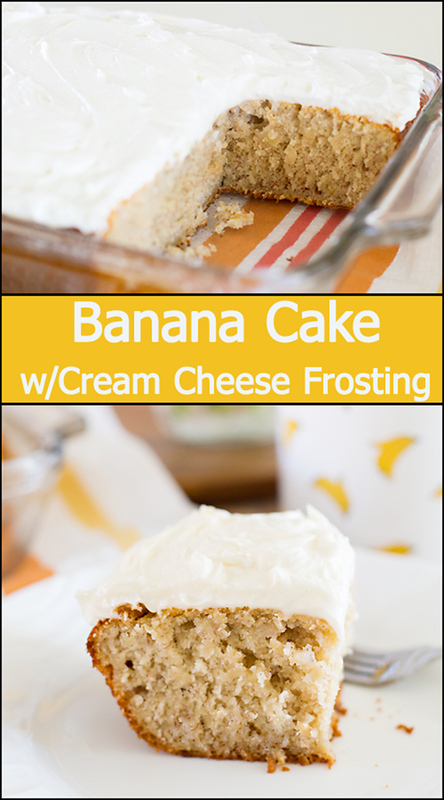 Frost liberally with cream cheese frosting (recipe below) and place in refrigerator for about 30 minutes before serving. 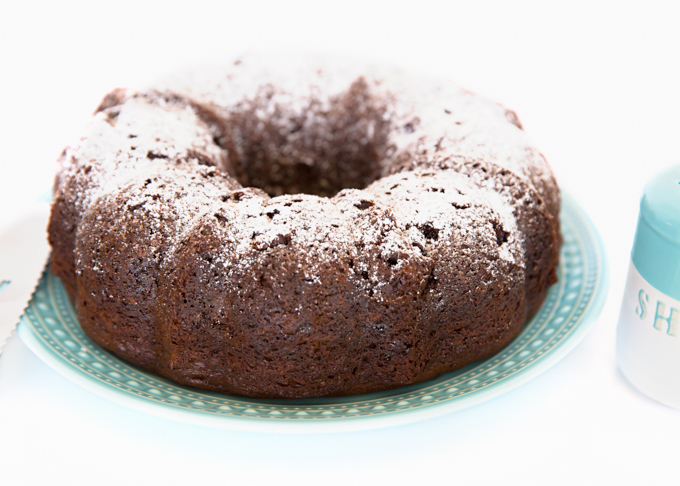 Frosting: In large bowl, add softened butter and cream cheese. Cream together on high until creamy. Add vanilla and mix. Slowly add in powdered sugar and salt and mix (turning to high) until frosting is well mixed and fluffy. If needed, add additional pwd. sugar to thicken. Or thin with a drizzle of milk if needed. Here’s a few more sweet treats you might enjoy!